This guy knows what I'm talking about! I was never one to take the easy way out when it comes to getting a good meal. I’ve gotten myself in trouble looking for that back alley bar in Tokyo or wandering a bit too far off of the resort in the Caribean. Usually it ends up with me finding an awesome meal (or a cockfight). I had no clue that when I was down at SXSW in Austin last week, I’d find myself in one of those situations. No, I didn’t end up at a back alley cockfight, but I did have some authentic Texas barbecue. I wish that I could take credit for doing extensive research on authentic barbecue joints. I wish I could tell you that I have Bourdain or Zimmern on speed dial. No, I used good ol’ crowd sourced social media. I asked the great all-knowing gods of Yelp, and they told me “Head east, young(ish) man”. So, along with a carload of colleagues (I do actually work for a living. I mean people don’t pay me to eat pig…yet) I headed down 12th street to Sam’s Bar-B-Cue. I’m a firm believer that the sketchier the neighborhood is, usually the better the indigenous food will taste. The best piece of sushi I ever had was down the back alley of some weird Yakuza looking street in Osaka. The best pollo a la brassa that I have ever eaten came from Spanish Harlem (when it was a bit more dangerous than it is today). I was pretty giddy when we rolled up on Sam’s. I was definitely in the part of town that not many SXSWers would dare to venture. In fact, it was definitely the least populated dining experience I had the whole week in Austin. So, along a strip of Austin that I later found out has the reputation for street gambling and prostitution, my colleagues and I had some of the best ‘cue that I’ve eaten. I opted for the pork ribs and brisket. 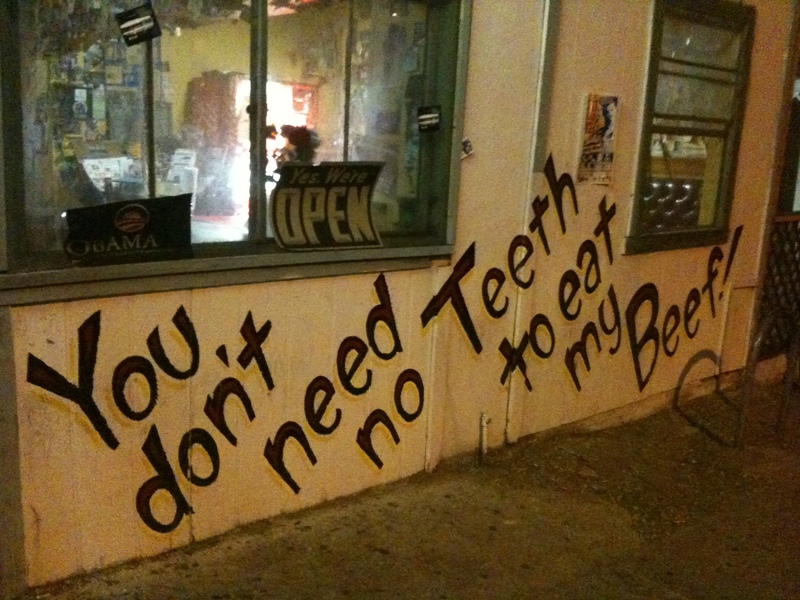 The latter definitely lived up to the sign painted on the side of the wall that read “You don’t need no teeth to eat my beef”. I’ve eaten a lot of barbecue in my day; it sort of goes along with the territory when you love piggy as much as I do. I’m sure that I’ve had ribs and brisket that were as good, if not better that Sam’s, but that particular night, at that particular time, that meal was definitely at the top of my smoked meat list. When we were leaving a local pulled up and went inside to get his order. As he was leaving, he stopped and asked if we were the ones that just checked in to Sam’s on Foursquare (which, by the way, earned us a special badge). He looked us up and down and said, “Man…only during SXSW”. I’m pretty sure the implication was that his local BBQ joint, on a bad street, in an bad neighborhood, never gets any tourists. That was all the validation that I needed. See you next year, Sam! I was loving the paintings on the wall. The inside was covered in autographs and pictures of famous musicians. Apparently it was Stevie Ray Vaughn’s favorite joint. The mutton was fantastic. I’ve never felt less guilty for eating so much fatty meat. The beans, also, deserve special mention. Perfectly cooked, slightly spicy and a great compliment to the meal.